SANTA MONICA, Calif. – April 29, 2014 – OUYA today announced that DUCK GAME, a fast-paced local multiplayer battle royale, will be coming to OUYA on May 13. 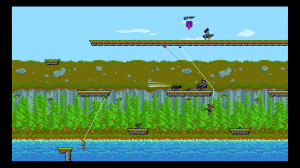 With frenetic head-to-head combat, a smorgasbord of weapons, and a dedicated button for quacking, DUCK GAME is the ultimate couch multiplayer game for settling a score. 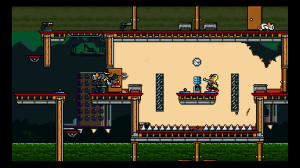 Designed by Vancouver-based game developer Landon Podbielski, DUCK GAME is a non-stop quack attack that pits up to four friends against each other in fast-paced multiplayer combat. With tons of weapons and more than 50 different arenas to fight in, players must adapt and adjust strategy on the fly. Gain aerial superiority by combining a jetpack with a mini gun, corner opponents with a net gun, or rain good ol’ fashioned grenades on them from afar. For more information about Duck Game, please contact TriplePoint PR at (415) 955-8500, or at ouya@triplepointpr.com. Landon Podbielski is an independent game developer and music composer based out of Vancouver, Canada. Landon is the creator of DUCK GAME, a local multiplayer duck-based combat game, and is prepping the title for launch on OUYA this spring.